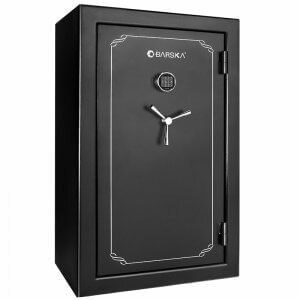 Store up to 45 rifles and accessories with the FV-3000 Fireproof Vault Safe from Barska . The FV-3000 Fire Vault Safe is designed to provide maximum security for your firearms and other valuables. 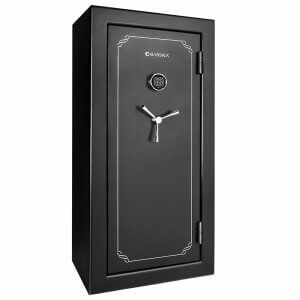 This Vault Safe features fireproof construction and is fitted with 6 solid-steel locking bolts for maximum security. 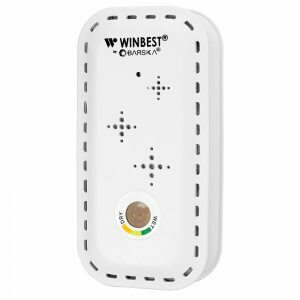 A quick entry electronic keypad allows the user to securely access the contents inside at a moments notice. 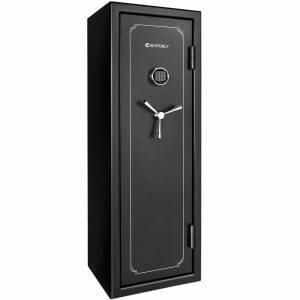 Keep your firearms and valuables secure with Barskas FV-3000 Fire Vault Safe. The FV-3000 FireVault Safeby Barska features an all-steel construction designed to protect and secure your firearms and other valuables. This Fire Safe is CA DOJ Approved andfitted with a pry-resistant recessed door to prevent tampering, and pouches on the inside of the door for storing and organizing additional items. The internal shelves are fully adjustable to meet your specific storage requirements.The electronic keypad lock features a low battery warning and a lock out mode in the event that the incorrect code is entered too many times. Interior is completely lined with upholstery to prevent scratches or damage to the valuables inside. Two back-up keys provide secondary access to the Barska Fire Vault Safe. The FV-3000s solid steel six point deadbolt locking mechanism ensures that your firearms and valuables are safely secured inside. 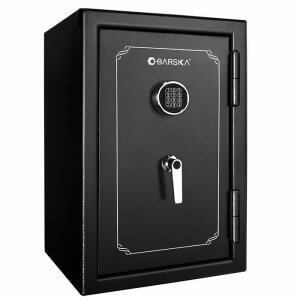 This Barska Fire Vault Safe also comes with pre-drilled holes on the bottom of the safe to securely bolt down to the floor. Mounting hardware is included. This is a HUGE safe. It has all the space I've ever wanted. Good place to put my ARs and my family's valuables. The fireproof feature is the reason I bought it and it was a better deal than the Liberty Safes I've looked at. Saved me a lot of money and still gave me the features I wanted.